Adventure Time Recap - "Billy's Bucket List"
Tonight's season finale of Adventure Time focuses on minor character "Finn the Human." Weird. Spoilers to follow! We open in the Candy Kingdom, as Finn and Rap Bear (one of the bears from way back in "Belly of the Beast," from the second season) having as sick rap battle. Finn wins handily by rhyming "millions" with "sequilidilians," and Rap Beart breaks down crying. "How can I be Rap Bear if I'm not the best?" Finn tells him that he is the best, and that Finn is honored to have gone up against him, saying Rap Bear is his hero. Party Pat says to Finn that he thought Billy was his hero, and Finn says that Billy is dead. This makes him sad, and he has an imagination dream sequence, ending with Lich!Billy's torn face. As Finn and Jake leave the rap battle, who should stroll up but another giant, like Billy. She introduces herself as Canyon, Billy's ex-girlfriend. She knew Billy and Finn were friends, so when she saw his name on the rap battle poster, she decided to bring Finn something that used to belong to Billy which she doesn't want to be around any more, his old loincloth (which Finn wears as a shroud, despite apparently being pretty smelly). Finn asks if she's been back to, wait for it, Billy's crack (that's his hideout) since he died, and she tells him it's been too sad. They decide to go visit Billy's crack (get it?) together. Once they arrive at Billy's crack ('cause, you see, butts), they find the place infested by fairies. They tell the fairies to shoo, but they refuse. Out of the shadows walks Jordan, Lord of the Fairies. Hey, look! It's Mark Hamill! Finn uses his grass blade (side note: I found it interesting that Jordan appears to Finn and calls him "a blade of grass in a maelstrom." I'm not sure if there's really any significance, but I still found it noteworthy) to cut Jordan's pants, and they fall to the ground. Jordan says that isn't good enough, so Finn lops off his head. Jordan's head agrees to leave, and the fairies fly off. Finn and Canyon chill on Billy's giant motorcycle, and talk. She tells Finn that Billy and she were quite an item, and that she always really believed in him, but when he stopped believing in himself (which, as you'll recall, was the situation way back in season one's "Billy") the two of them broke up. Canyon notices a giant note rolled up in the motorcycle, and pulls it out. 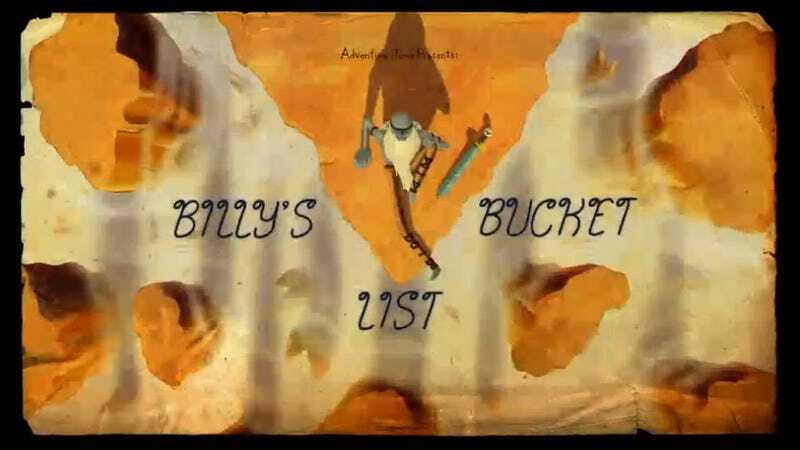 It turns out that it contains Billy's bucket list. The list contains items like "Pummel that jerky camel," and "Defeat the Lich," but most of the items are crossed off. The only two items not crossed off are "Take Canyon on one last ride," and "Tell Finn that thing." Finn asks if Canyon knows what that thing was, and she says she doesn't. "Okay, that's going to bother me forever." Finn and Canyon decide to go on one last ride on Billy's giant motorbike in his memory, and we get a cool sequence involving Finn driving a motorcycle made for giants, a snake monster getting punched in the face, and a totally sweet jump, before Finn and Canyon grab onto a branch as the bike plummets off a cliff. At the bottom of the cliff, near a river, Canyon and Finn split up. Finn asks if he'll see her again, and she says she's sure their paths will cross eventually. She parts the waters of the river, and walks into them. As Finn is crossing off Billy's bucket list, he notices one last item written at the bottom of the note, where it had been curled up before. "Lie on my back in the ocean. Just float." This episode is apparently the "calling back to the early seasons" episode, because if you'll remember back in the season one episode "Ocean of Fear," Finn has a terrible phobia of the ocean, and the last time he tried conquering it… Things didn't go well. There was a ghost made out of fear, he was knocked unconscious, almost drowned, you know how it is. Well, despite his fears, Finn decides he has to do this for Billy's and tries conquering his fears, and running into the ocean. He totally chicken outs… Which causes the Fear Feaster to appear once again. Hey! Look! It's Mark Hamill again! As the Fear Feaster taunts him, he walks onto the ends of a ruined (presumably pre-war) pier, and hits himself in the face with a plank, falling on his back into the ocean, to float. As Finn falls deeper and deeper into the ocean, we get a dream sequence where a whale takes his hat, and a giant version of his hat water elemental whale… Thing, tries to murder him. He proudly screams "For Billy!" and is eaten by the whale. Finn is woken up by the Fear Feaster once again, drifting in the middle of the ocean. Finn's sword arm suddenly slaps Finn in the face, before it (much to Finn's surprise) begins pulling his grass blade. The Fear Feaster laughs again, saying "No mortal blade can harm me!"... Before being cut in half by the grass blade, and immediately dissipating. Aw. I almost feel bad for the Fear Feaster in this episode, he's just so darn ineffective. "Was that you or me?" Finn wonders out loud to his blade. He then realizes he's floating in the ocean, and not afraid. As he laughs, and proclaims "I'm not afraid of the ocean any more!" we suddenly hear "BILLYYYYY!" (because Billy is pretty metal) and the heavens open up, revealing the face of Billy in the stars. Billy tells Finn that now that his bucket list has been completed, he can rest like a great hero. "Thank you Finn!" he says. Finn says he's welcome, and that Canyon helped too, and billy says to tell Canyon that he watches her sleep. "Love is weird." Finn asks if that's what he meant to tell him, and Billy says no, and then starts to disappear. Finn shouts for him to wait, and Billy reappears. Finn asks what that thing he meant to tell Finn was, then, and Billy says "You must go to the citadel. That's where your father is." Finn tells him that can't be right, and that Joshua isn't alive, and Billy clarifies, "Not Joshua! Your other dad. Dad the Human. Your father, Finn. He's alive." Billy's words echo as we zoom out from Finn, and cut to some sort of crystal thing floating in space, and see the silhouette of someone— Someone distinctly human looking —within a crystal. And then we cut to a Cartoon Network teaser for the next season of Adventure Time, coming in April. Not soon enough! Well geez, let's start with that cliffhanger. I have to say, I didn't see it coming. I'm really interested to see where the show will take this. Odds on Finn's dad being a villain, anyone? Oh, and for the record, I would be very happy if "Dad the Human" turns out to be Finn's father's name. It's been a while since we've gotten a Finn (and/or Jake) centric episode. The last one, really, was "The Red Throne," and I'm glad the return to our main character was at least a good episode. Canyon was interesting, and I'd like to see more of her. To my knowledge, I don't think we'd seen another giant (or whatever Billy is) until this episode, and the fact that there are apparently more of them out there is exciting to me. Are we going to have an episode where we go to the giant kingdom? Are we going to find out why Billy was a bit of a loner, living a life of adventure, instead of with his people? I don't know, probably not, but it'd be interesting to see. Of course, seeing Lou Ferrigno's Billy is always a lot of fun, and this episode was a really great send off to him. There were a lot of callbacks to really early Adventure Time in this episode, and I enjoyed catching them (or at least, the ones I did catch). Adventure Time has always been masterful with continuity, which is why I like it so much, but callbacks to the really early stuff are pretty rare. "Bad" might be a little bit strong for these, but there were a few elements in this episode that just didn't totally click with me. I alluded to this in the recap portion, but just to be clear, I don't think the "Billy's crack" stuff was funny. That's just me. I don't find that kind of joke funny, I didn't find it funny here. This is a really pretty complaint, but I just don't feel like they're making the best use of Mark Hamill, here. Adventure Time has had a lot of celebrity voice work done, and they usually make a lot out of it (Neil Patrick Harris as Prince Gumball, Keith David as Flame King, Weird Al as the Banana Guy, George Takei as Ricardio, the list goes on and on), but here, Mark Hamill basically amounts to a cameo. The part that really bothered me, specifically, was his appearance as Jordan, King of the Fairies, because to be totally frank that brief bit added nothing to the episode. I don't know what the situation with getting Hamill into the episode was, maybe that really was all the Hamill they could get, but I would have liked to see more of him is all I'm saying. This actually brings me to my other petty complaint, the bit with the fairies was just pointless. It added nothing but a few seconds (and I do mean seconds, it was a short bit) of padding to the episode. It wasn't aggressively bad, or anything, it was just… Nothing. Overall, it was a good episode of Adventure Time. I'm not sure if it quite stacks up to the stellar run of episodes we've had the past few weeks, but taken of its own merits it's a good episode, and seeing Billy finally get a real send off was a very good thing. We're at the end of season five now, and the show, especially with the past few episodes, has been ramping up for some pretty crazy stuff to happen next season. The mutants from "James" are still on the loose, Princess Bubblegum is getting more morally ambiguous by the second, Betty is out there somewhere looking for a cure for Simon, Cinnamon Bun may or may not be possessed by Don John, and (in addition to other plot threads I'm sure I'm forgetting about) now Dad the Human is apparently out there somewhere. Will we see all of these threads resolved in the sixth season? Probably not, but I can't wait to see where they go.